Artist Trading Cards are miniature artworks about the same size as modern trading cards or baseball cards, and small enough to fit inside standard card-collector pockets, sleeves or sheets. The focus of this event is friendly ATC trading and swapping in a relaxed and welcoming atmosphere with even trading. That is, one card given for one card received. This swap is open to craftspeople at all experience levels. It is accepted that a wide variation of creative/technical skill will be apparent in the swap. The ATC's that you bring to this swap should be all alike. Your ATC must be 2.5"x3.5" Create your ATC on a base of card stock. Edges should be finished and not rough or irregular unless that is part of the design. Show your style. Express yourself. Your cards do not need to be "masterpieces" but should be simple pieces that you are willing to give away when you're done. Follow the "Golden rule of ATC's" and create the quality of ATC that you would want to receive. Sign your cards on the back. And attach contact information, if you choose to. How many ATC's should I bring? You should bring enough to trade with others. Because this is the first swap, it is uncertain how many will participate. Are you interested in being a vendor? Now is the time to clean out and organize. Sell those rubber stamps and card making supplies that you do not need or use anymore - and receive "In Store Credit!" A non-refundable $5.00 administration fee is due at sign up. You will receive a Vendor Code and Participant Agreement Form. Rubber stamps and card making supplies only. Each item must have a label that includes your vendor code and a price. The label must be affixed securely. If it comes off, we cannot sell it, and the item will go in the lost and found box. Items may be bundled and priced to sell as one item. Priced items should be placed in a container or cardboard box that is clearly labeled with your name, phone and vendor code. Let us know if you want your container returned after the sale. Drop off your items during store hours no later than Saturday, July 14th 2018. Items will not be accepted after this date. You do not need to be present during the sale. We will keep track of the dollar amount sold. No tax will be charged. We are not responsible for anything lost/stolen/misplaced or other discrepancies. Pick up any unsold items between Monday, July 30th and Saturday, August 11th 2018. You will receive $1 "In Store Credit" for every $1 sold at the rummage sale. "In Store Credit" is valid for merchandise only from Pearl Street Stamping or Tremont Gallery. "In Store Credit" cannot be used for gift certificates or classes. There is no expiration date for the "In Store Credit." If you have questions, please contact Carla or Ann at Pearl Street Stamping at (309) 925-4438. Welcome to Tremont Gallery and Pearl Street Stamping! Welcome to our website. If you have visited our store in central Illinois, you know what types of gifts and collectibles Tremont Gallery offers. We carry quality merchandise that is unique and different from what you may be seeing in other locations, and new merchandise is added on a regular basis for your shopping enjoyment. 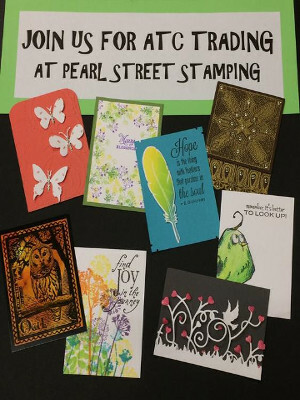 1000's of rubber stamps are available at Pearl Street Stamping, located inside Tremont Gallery. Card making supplies are also in stock. Rubber stamping is a fun and rewarding hobby for all ages. If calling locally, please call us at 309.925.4438. After hours, please leave a phone message. We will return your call the next business day.